Enjoy a relaxing holiday with Houseboat Hire. “Lake Eildon and district is one of Australia’s most popular destinations due to it’s proximity to Melbourne. Lake Eildon (with around 550 kilometres of shoreline) is fed by clear mountain rivers and is surrounded by rolling mountains, heavily clad forest and open woodland, making it a favourite venue for boating and waterskiing, ﬁshing and bushwalking. The surrounding countryside is prized for its eucalypt forests, its wildlife and its fresh mountain air. Brown trout, rainbow trout, redfin, perch, Murray cod, roach, tench, and carp are some of the species that can be caught around Lake Eildon and local rivers” - Lakeview Boat Hire. 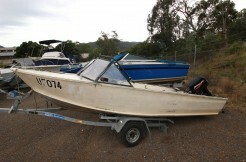 We specialise in holidays on magnificent Lake Eildon. There’s always plenty of room to move & the lake is surrounded by stunning scenery. In fact the whole area is a water lovers, water sports, fishermans & photographers delight. The Jerusalem Creek Marina has a small fleet of picnic boats for hire. These sturdy and stable pontoon boats are Marine Safety Board Surveyed and are ideal for touring & site seeing or a fishing trip. They are available for hire for just a few hours or for a day trip on the lake. There are 540 km of inland waterways that offer premier conditions for water sports and boating activities. The best way to take advantage of the hundreds of small bays and hidden coves is on one of our fully equipped houseboats. The range of houseboats available gives you the freedom to escape the pressures of everyday living within a budget to suit your needs.